Winner of the Sonic Art category in the 2015 British Composer Awards. Artist and musician Yann Seznec often uses technology as a medium to reveal natural processes that are imperceptible to the human eye or ear. In Secret Sounds of Spores (2011), for example, Seznec collaborated with mycologist Patrick Hickey to create an installation which used light and sound to reveal the thousands of spores deposited every day by mushrooms. Currents expands Seznec’s interest in technology as a tool, to consider how it shapes our environment. 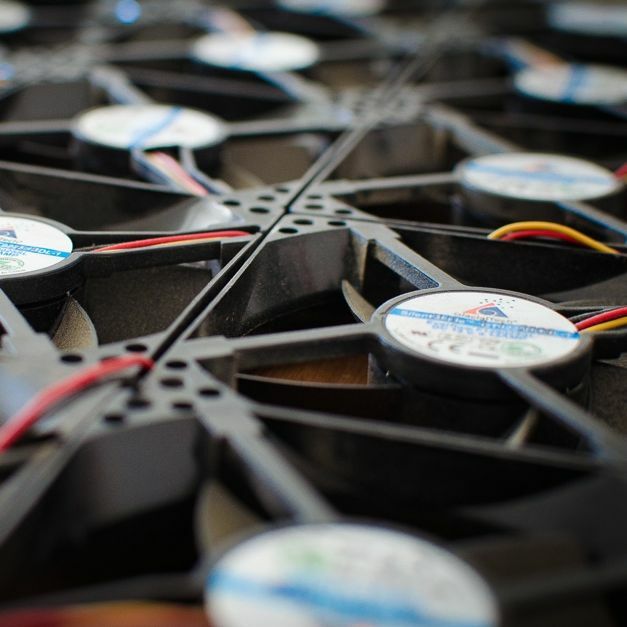 Computer fans are now a ubiquitous technology, used to cool down machinery when we produce, consume or analyse information. Frequently discarded, the fans point to our obsession with change, as well as the realities of a global economy that make it cheaper to produce anew rather than repair. Constructed entirely from discarded computer fans, Seznec’s new work is a physical and sonic experience, drawing on real-time weather data from around the world to move air around the visitor. If Seznec’s earlier works have made visible hidden natural processes that surround us, Currents allows us to experience large scale global movements (economic and meteorological) in microcosm. Currents was part of the 2014 Edinburgh Art Festival. A series of free concerts took place in various cities across the UK over the summer. Commissioned by Edinburgh Art Festival, Currents is produced by Suzy Glass. Currents is part of PRS for Music Foundation’s New Music Biennial, part of the Glasgow 2014 Cultural Programme. Supported by Hope Scott and Retrouvius; fans kindly donated by Computers4Charity.